Kitchen science, canteen experiments, luxury chocolate … and pizza. All on the menu at the 2014 I.Family General Assembly! As a project investigating food choice in European children, adolescents and their parents, it’s no surprise that I.Family’s General Assembly (GA) in Milan had a definite gastronomic focus! 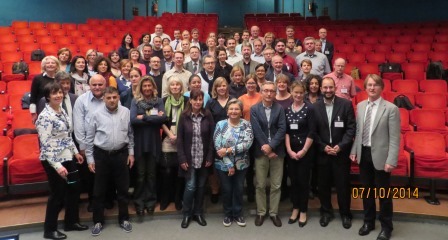 Held in October at the Istituto Nazionale dei Timori – a working cancer research hospital – the GA was a valuable opportunity for I.Family researchers from across Europe to come together in one location to share progress, ideas … and the odd slice of pizza. Social meals in the evenings were a good chance to get to know one another and build relationships – not to mention sample traditional Italian and Sicilian cuisine. A lunch held at the INT itself gave delegates the opportunity to try dishes developed specifically to cater for the nutritional needs of its cancer patients. But our principal objective in gathering together was to collaborate and learn for the ongoing benefit of the project. Presentations from each of the nine work packages brought the consortium up to speed on developments and challenges encountered across the research disciplines of the I.Family study. Keynote lectures were supplemented with a packed agenda of break-out practical sessions and discussion panels, ensuring that there was something on the conference menu to suit everyone’s tastes. If we wish to impress upon children the importance of healthy eating, school canteens are a good place to start! 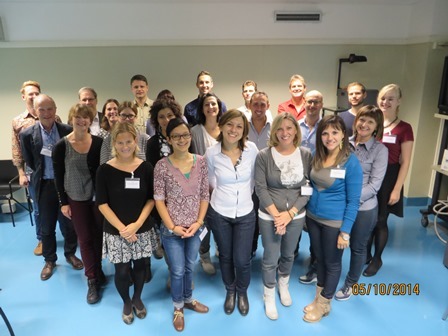 That was the message from Dr Wencke Gwodz, associate professor at Copenhagen Business School, who delivered a seminar on a canteen experiment being co-ordinated and delivered by I.Family researchers in European schools. The experiment is designed to test whether a simple incentive (a ‘smiley’) offered to young pupils would encourage them to choose healthier options in the school canteen. Monica Hunsberger from the University of Gothenburg was also on hand to offer a few salutary lessons about the challenges of running real-time experiments – such as kitting the research team out in the right health & safety kitchen equipment (shopping for gloves, hats, aprons…), running to the local store at the last minute to buy carrots when a delivery failed to turn up at the canteen – and what to do when a child’s clip card falls into a bowl of soup. Look out for a point of view on this coming soon! ‘Kitchen science’ is not an easy thing to set up in the basement classroom of a research hospital. 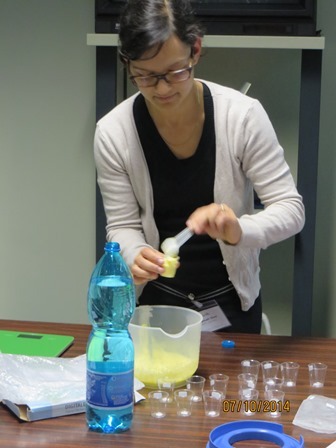 But armed with a whisk, some bottled water and several bags of vanilla-flavoured powder, Hannah Jilani (young researcher from BIPS, pictured left) expertly demonstrated the sensory taste perception test experiment [see below]. The experiment is a taste intensity test conducted with children, adolescents and their parents to assess sweet and fat taste perception of different puddings. And the food theme continued during the media training workshop, where a bar of luxury chocolate was offered as the prize for the person giving the best TV interview.